This vegetable has many healthy uses! As an athlete, I recommend eating broccoli— a cruciferous vegetable that belongs to the cabbage family— because it’s an excellent source of vitamin A, vitamin C, oleic acid, calcium and it is rich in fiber. A one-cup serving of broccoli is just 32 calories. Nervous System: Broccoli contains a high amount of potassium, which is important to maintain a healthy nervous system and brain function, and it promotes regular muscle growth. 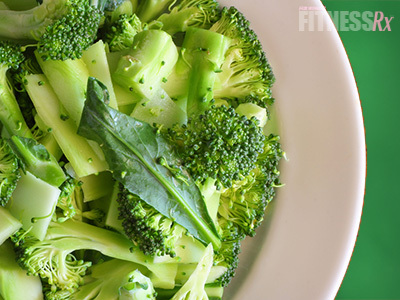 Broccoli also contains magnesium and calcium, both of which help to regulate blood pressure. Vitamin C: Broccoli contains vitamin C, an antioxidant necessary for fighting against free radicals and boosting the immune system. It also has trace minerals such as zinc and selenium, which are also important for the immune system. Cancer Prevention: Broccoli contains indole-3-carbinol, a powerful antioxidant compound and anti-carcinogen found to not only hinder the growth of breast, cervical and prostate cancer— it also boosts liver function. Researchers at Johns Hopkins University School of Medicine in Baltimore isolated from broccoli an isothiocyanate, called sulforaphane, which increases the activity of enzymes in our bodies that suppress cancer-causing agents. Eye Health: Studies have shown that the carotenoid lutein helps prevent age-related macular degeneration and cataracts. Additionally, broccoli is a good source of vitamin A, which is needed to form retina. Prevent some birth defects: Broccoli is a good source of folate (folic acid), which is important in preventing birth defects. One raw broccoli spear has 107-mcg folate, more than 50 percent of the Recommended Daily Allowance for an adult. Eat it raw, steamed or stir-fried… broccoli is delicious!